The curved inside edge keeps food from sliding off the plate to make self-feeding easier for children or adults. Plate with Inside Rim... 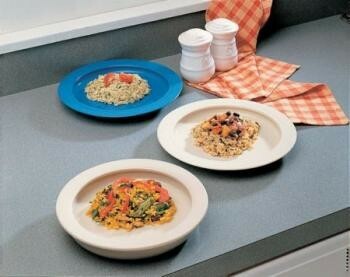 The curved inside edge keeps food from sliding off the plate to make self-feeding easier for children or adults. Dishwasher safe up to 80°C (180°F) and microwave safe. Made from polypropylene. Plate is 230mm (9") in diameter with a 25mm (1") rim and a 13mm (1/2") edge.